Mark and I has planned a get away for President’s Day weekend. After the storm, we had been tasked to clean up the damage. So, we weren’t sure that we would be able to get away like we hoped. On Saturday morning, we got up early and tackled dismantling the mangled horse shelter. Once we were done, we looked at each other and knew that we’re going to on our mini get away. 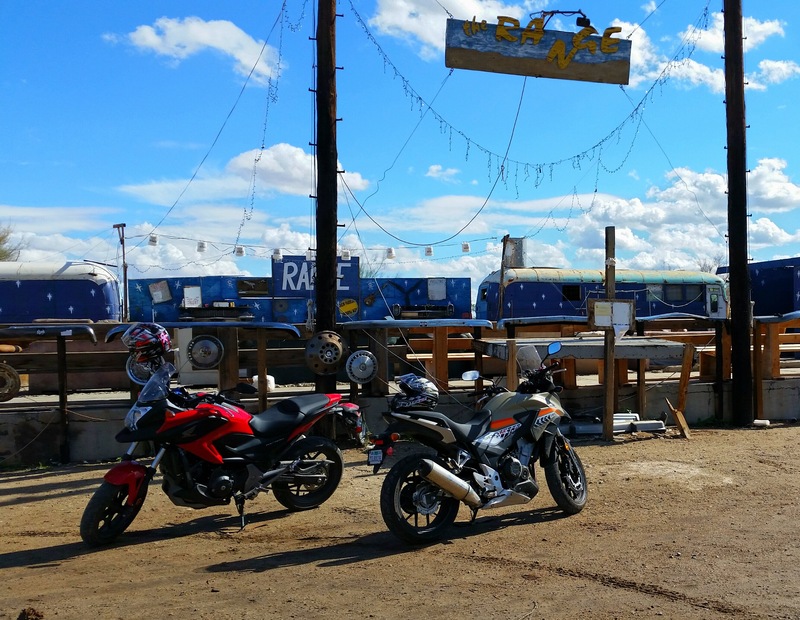 So, we quickly got cleaned up, packed and jump onto the bike to head out to Desert Hot Springs. Our original plan was to go to the Living Desert on Saturday, Salvation Mountains with a ride through Box Canyon on Sunday and Cabot’s Pueblo museum on Monday. Since, we had a late start on Saturday, Living Desert was out the window. On Sunday, we sat down with our friend, Jeff Bowman on his opinion of Box Canyon which runs through a ravine between Interstate 10 and Highway 111. After this storm, we didn’t know the condition of the roads and opt not to take our chance. So instead, we decided to ride around Salton Sea and with a stop at Salvation Mountain. Next to Salvation Mountain is a snowbird community known as Slab City. It’s take it name from the concrete slab that remained from a decommissioned World War II Marine base. Today’s challenge is to post the 25th picture from your phone or camera. It happened to be the picture we took next to The Range at Slab City. It is an open-air nightclub complete with stage, home made lights, amplifiers, speakers with ratty couches for seating. Every Saturday night at around dusk, locals and visitors meet for a talent show that features permanent resident musicians and anyone else who wants to get up on stage and perform. I have heard about this. Have you ever been there for a performance? It seems to me it would be a little scary, but also “can’t look away” fascinating. No I haven’t been there for a performance. Yes the place is not a safe place to go by yourself at night.